As I am writing this post, my legs are exhausted and my body is calling me to finally zzzzzzzzzz. Saturday was filled with accomplishment and happiness. I woke up at 5 am to start my regular fitness activity. No matter what it takes, I promised my screaming bulging belly to shed off those extra lbs. It's time to pay for all those meal and Coke upsizes. Though I was near SM Marikina, no shopping attempt was made. ;-) I jogged and enjoyed the outdoor atmosphere with some greenery left in the city. After a perspiring walk, I went home to prepare for a meet up with my girlfriends. They are my super girlfriends. I've known Anne ever since I was 14 years old. We had common friends in High School and we went in the same university for college. I've known Anna and May Ann for 18 years. We were classmates in grade four and our senior year in High School. Notice the rhyme in our names? Anne, Anna, May Ann and Diane... God perhaps knew that we will eventually become friends in the future so He made our parents chose our rhyming names. The main reason of our meet up is because someone's celebrating her birthday! Can anyone guess who among us is celebrating her special day? The girl in blooming pink turned YOUNGER! ;-) Happy Birthday Anna! Anna wanted to see Binondo on her birthday so the loyal friend in me said, your wish is my command beautiful! I gave my friends a mini tour in Manila. Our first stop was the historic Intramuros in Manila. Anna wanted to start the day with a prayer so I brought her to the Manila Cathedral. 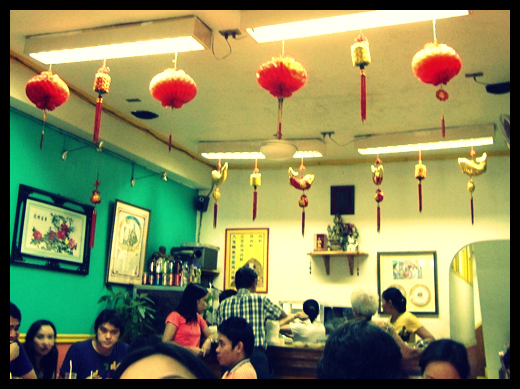 I would like to believe I fulfilled Anna's wish of eating at Binondo. Binondo is the Philippines' main China town. Binondo is believed to be the oldest China town in the world. It was established in 1594, when the Philippine was still a colony of Spain. The Spanish government allowed Chinese businessmen who have inhabited our country to stay in this place. Soon, the accumulation of Chinese entrepreneurs have developed the place to be a center of trade, commerce and the best Chinese foods in the Philippines. Thank you Anna. But I think I need to devote more time for jogging tomorrow. Wishing everyone a great weekend. What a fun day with friends (how funny that your names are all so similar). That food all looked so delicious!! Looks loke you guys had fun! As usual the food looks so good. Boy girl you are dedicated. Rising at 5 a.m. is quite a feat. I'll stick with my 7. Although, I need to shed some poundage also. Spending time with friends is always such a treat. Happy Birthday to Anna! That chicken looks so delish! Glad you had a fun time! You had some great quality girlfriend time, Diane! How wonderful! Y'all also had some wonderful food, too. I think it is so cute that y'all have rhyming names. Happy Birthday to Anna! What a fun day you gals must have had! You always make me so hungry when you show pictures of such yummy taste treats! It sounds like Anna had a wonderful birthday with all her friends. Remember: calories don't count when you're celebrating a birthday...even if it's not your own!! What a day! The chicken dish looks so yummy and Binondo looks so interessting. 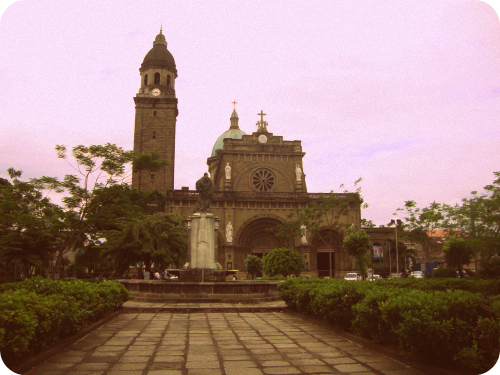 Manila Cathedral is beautiful....only thing out of place is the coke...LOL. You sure treated Anna to a lovely day!!! Sounds like you had a wonderful day with your friends. It was a nice gift you gave the birthday girl. You are lucky to have such good friends, and they are very lucky to have you as such a very good friend. Enjoy the rest of your week, Diane. how interesting! i didn't know that "Binondo is believed to be the oldest China town in the world." thanks for sharing, i enjoyed your post. The food pics made me hungry! :) Happy birthday to Anna! Hi Nancy! The animals in the first photo are not real ;-) A lot actually get deceived by those carabao replicas.